Story: From 1987's wartime comedy "Good Morning, Vietnam" to 1997's current-events satire "Wag the Dog", Oscar-winning director Barry Levinson's films have often drawn their humor from a rich comedy source -- the political arena. He has examined our politicos' decisions and deceptions ... and helped guilty voters laugh as we share with our elected leaders the fall-out of some pretty bad choices. Now in his new comedy, the writer-director asks us to ponder a 'what-if' scenario that doesn't seem so far-fetched in 2006: what would happen if a computer voting error allowed one of the nation's funniest men to become its president? As we rapidly approach November 7 and the mid-term elections, Levinson explores the convergence of U.S. politics and pop culture events of the past decade -- savvy pro-wrestlers and muscle-bound action stars have moved into governors' mansions while millions of Americans receive their nightly news from wisecracking talk-show hosts ... not the stern newscasters of the past. In "Man of the Year", he brings a cast -- all of whom understand that this blurry division is not an alien concept for a media-devouring country -- to erase the fine line between entertainment and government. Welcome to the story of one entertainer's accidental rise to power. 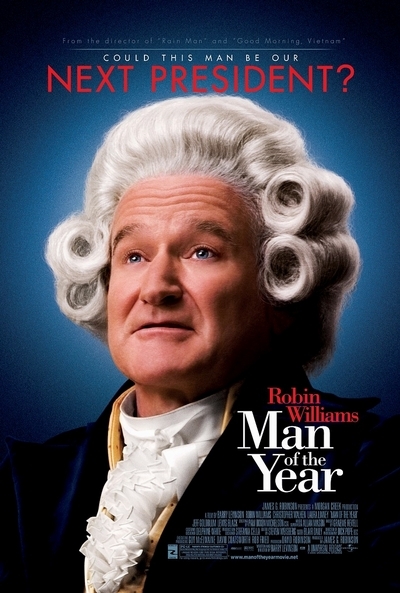 With his razor-sharp wit and signature style, Robin Williams plays acerbic performer Tom Dobbs, a guy who has made a career out of skewering politicians and speaking the mind of the exasperated nation on his talk show. He cracks jokes at a fractured system night after night ... until he comes up with a really funny idea: why not run for president himself? After one flip comment too many, Dobbs ignites a grassroots movement that puts him on the presidential ballot. Hot on the campaign trail -- with his manager/mentor, Jack Menken (Christopher Walken), and wisecracking head writer, Eddie Langston, in tow -- he debates elected drones and asks what frustrated voters have so often pondered: "What has happened to leaders' responsibility to the very citizens they serve?" On election day, Dobbs stuns the unsuspecting world by winning the vote. A shocked country wakes up to find that they have a new leader of the free world ... the nation's favorite wiseguy. But a scrupulous voting-software analyst, Eleanor Green (Laura Linney), soon learns that a glitch in her company's voter software gave Dobbs a victory that was never meant to be his. Her mission? Help Dobbs learn the truth before her Machiavellian employer hunts her down, destroys her credibility and buries the secret of the botched election forever. Now pursued by both Eleanor and her company's nefarious chief legal counsel, Alan Stewart (Jeff Goldblum), Dobbs has a big decision to make as time ticks on his inaugural clock: should he go back behind the mike or stay in the Oval Office and keep shaking things up?